Comm Eye Health Vol. 19 No. 59 2006 pp 52 - 53. Published online 01 September 2006. Director, Pakistan Centre for Vision Sciences, Pakistan Institute of Community Ophthalmology, Hayatabad Medical Complex, Peshawar,Pakistan. Associate Professor of Health Planning and Management, Institute of Management Studies, University of Peshawar, Pakistan. In Pakistan, there is a unique and indigenously established system of education called the madaris. It is the plural of madrassa, which is an Arabic word for a school system. In the context of Pakistan, it refers to an institutional set-up that runs in parallel to the conventional schooling system and is community-based. It is perhaps the oldest and the largest educational system of its kind whereby the students are provided with free religious education. Some institutions offer a combination of religious learning and regular schooling. The facilities and the curricula vary from one madrassa to another. Since a majority of the students studying here belong to the poor and neglected socio-economic level of society, many offer free accommodation and food to the students in hostels, and most of these provide free education. These institutions are mostly funded by philanthropists; the standard of living of the students, however, is not always satisfactory. A few madaris provide basic health care services to their students, but most are neglected both by the government and the voluntary sectors. It is difficult to find data on the health status of these students. This article reports a study on these madaris that was carried out in 2002 in the district of Peshawar, the capital of the North-West Frontier Province (NWFP) of Pakistan which has a population of 2.5 million. It aimed to determine the prevalence of blindness and low vision among students in the age group of five to 15 years. It offers an agenda for primary eye care and highlights the importance of integrated health care reforms at the national level for this large non-government community education system that caters to an estimated half a million children throughout Pakistan. There are 160 madaris in the district of Peshawar. When strictly defined and verified, only 48 of them were considered functional as educational institutions. The others were functioning exclusively as mosques. Of these, one madrassa refused to entertain the survey and another was closed for summer vacation. The remaining included a population of 3,153 students, who were the subjects included in this study. The survey team included 21 members. 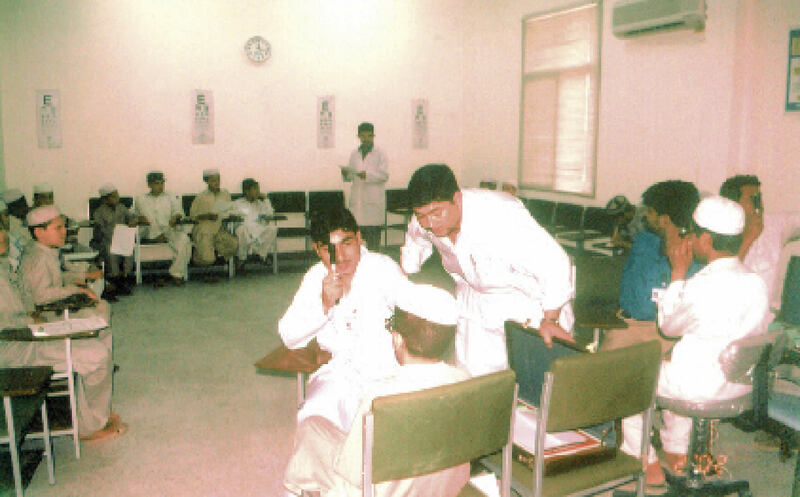 The lead author, then an MSc student of community ophthalmology at the Pakistan Institute of Community Ophthalmology (PICO), was leader of a team which included 10 trainee refractionists, eight trainee ophthalmic technicians and two female trainee ophthalmic nurses from the Pakistan Centre for Vision Sciences (PCVS). A total of 10 sub-teams were formed for the fieldwork. Each team was assigned a group of madaris and were made responsible for assessing visual acuity and screening the children with a vision of less than 6/12 in the better eye. A standard E chart was used for measuring visual acuity. The World Health Organization (WHO) pro forma was used (with minor changes) for recording vision. All the screened children were then brought to the PCVS for detailed examination. Children with refractive errors, i.e. those showing improvement with pinhole, were refracted by the trainee refractionists and were later provided with spectacles. Some children were also referred to the ophthalmologists at the clinical department of the Hayatabad Medical Complex for an expert opinion, to establish the cause of their visual impairment. The clinical examination included direct and indirect ophthalmoscopy and B scan, if indicated. The cut-off point used in the fieldwork was a visual acuity of less than 6/12 in the better eye. This cut-off point was taken to ensure better service provision for children with refractive errors. However, the results were analysed using the World Health Organization (WHO) definitions of visual impairment: a blind child was defined as one with a visual acuity of less than 3/60 in the better eye, and low vision was defined as a visual acuity of between 6/18 and 3/60 in the better eye. The response rate of this study was 98.5 per cent. Forty-eight children were found absent out of the total 3,153. No child refused examination. The number of males in this study was 3,026 and there were 127 females. The prevalence of blindness was 0.3 per 1,000 children, while that of low vision was 4.5 per cent. Table 1 shows the prevalence of blindness and low vision according to gender. However, it should be noted that the female sample was extremely small. There was only one blind child in this survey, a male with bilateral phthisis bulbi. Refractive errors were the major cause of low vision in this study. Out of the 142 children with low vision, 130 children had uncorrected refractive errors and 10 had causes such as hereditary maculopathies, optic nerve atrophy, amblyopia, etc. In one child the cause of low vision was cataract, and in another child the cause could not be determined (Figure 1). Since the study was the first one focusing on the setting of madaris, we did not expect a welcoming attitude from the authorities. We had expected refusals to the screening of children, due to the political circumstances at that time. The government of Pakistan had just started regularising these madaris all over the country and the madaris authorities had rejected this initiative as unnecessary interference in their institutional matters. Conducting a study at such a critical time could easily have given rise to suspicion in the minds of an already sensitive community. However, we did not find this to be the case. Almost all the students agreed to participate in the study (98.5 per cent). This possibly reflected the strict disciplinary environment in the madaris where students are used to acting promptly when requested by a teacher. Only 4 per cent of the respondents were female. The reasons for this small proportion are obvious. Firstly, there was only one madrassa that catered both for males and females, while one was exclusively for females. Secondly, the proportion of girls in comparison to the boys was low in these institutions because the society of the NWFP is predominantly conservative, and girls are not allowed to leave their homes, even for religious education. This gender imbalance would need to be addressed in any strategy to reach this socio-economic group, as we could not call it a truly socially inclusive strategy if girls remain unreached by services. It was hypothesised for this study that the prevalence of blindness would be higher because these children belonged to a poor socio-economic background. Contrary to that assumption, however, the prevalence of blindness turned out to be 0.3/1,000,1,2,3 which is low in comparison to the prevalence of childhood blindness in children of the same age group in the general population of a poor country like Pakistan. Interestingly, it is comparable to what we find in the prosperous countries of the world. It is too early to comment further on this, as one finds no data for comparison. Further studies in this area could explain this phenomenon better. The prevalence of low vision was surprisingly higher, i.e. 4.5 per cent. Although there is no data available for comparison regarding low vision in children, the gravity of the situation becomes apparent if we look at the prevalence of low vision found in the adults of a poor economy; for example, in Ethiopia4 it was found to be 1.7 per cent. In this study, uncorrected refractive errors were found to be the major cause of low vision in 91 per cent of the students. In comparison to this, an Indian study in schools for blind children showed that about 19 per cent of children with severe visual impairment improved with spectacles and magnifiers. The higher prevalence of uncorrected refractive errors in children with low vision in this study is not only a measure of the level of awareness, but it also reflects the fact that children, and their guardians, are not seeking help for visual problems, and that madaris do not offer primary eye care services or detection of visual problems. Hereditary disorders, amblyopia, etc. together accounted for 7 per cent of children with low vision. This proportion is quite small in comparison to other studies conducted in schools for blind children in Pakistan3 and India,6 where this figure was as high as 47.5 per cent and 34.8 per cent, respectively. In another study conducted in schools for blind children in India,7 12.3 per cent of severe visual loss was due to amblyopia, uncorrected aphakia and cataract. Almost all the children with amblyopia had unilateral high refractive errors that were never noticed by them because the other eye was normal and they had never had any eye examination before. VISION 2020: The Right to Sight aims to eliminate avoidable blindness worldwide. This study reveals a fairly large and neglected segment of the society of Pakistan. 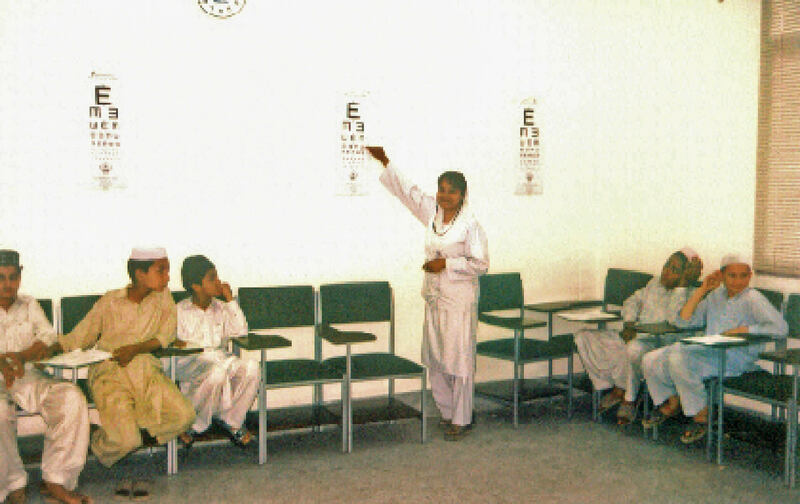 It invites the attention of planners and policy makers to develop a strategy to reach a wide range of communities which might not otherwise benefit from eye care services. Inclusion of the children in the madaris in the mainstream national strategy may not only serve as a mechanism to achieve the goals set out in VISION 2020, but potentially create opportunities to integrate them into national health care reforms. However, a strategy to reach the girls at home would be needed to complement this effort to reach out to the underserved. The findings of this study also highlight a strategic link between primary eye care reforms with the questions of social inclusion, resistance to change, and forces of alienation in a conservative society such as that of the NWFP. By focusing on the health care needs of a large segment of physically and socially vulnerable students at the madaris, the State would not only fulfill its responsibilities towards these children, but could also encourage acceptability and sustainability in its drive to regulate the madaris. 1 Gilbert CE. New issues in childhood blindness. J Comm Eye Health 2001;14(40): 53-56. 3 WHO. Programme for the Prevention of Blindness. Prevention of childhood blindness, 1992, Geneva. 4 Negussie Z and Mabey D. Blindness and low vision in Jimma Zone, Ethiopia: results of population-based study. Ophthalmic Epidemiology 1997;4(1): 19-26. 5 Sethi S, Daud Khan M. Survey of blind schools in North West Frontier Province (An institutional-based study). Pakistan Journal of Ophthalmology 2001 17;3: 90-96. 6 Stella J, Hornby, Shajan Adolph, Vijaya K, et al. Evaluation of children in six blind schools of Andra Pradesh. Indian Journal of Ophthalmology 2000; 48(3): 1. 7 Rahi JS, Sripathi S, Gilbert CE, Foster A. Childhood blindness in India: causes in 1318 blind school students in nine states. Eye 1995;9: 545-50.